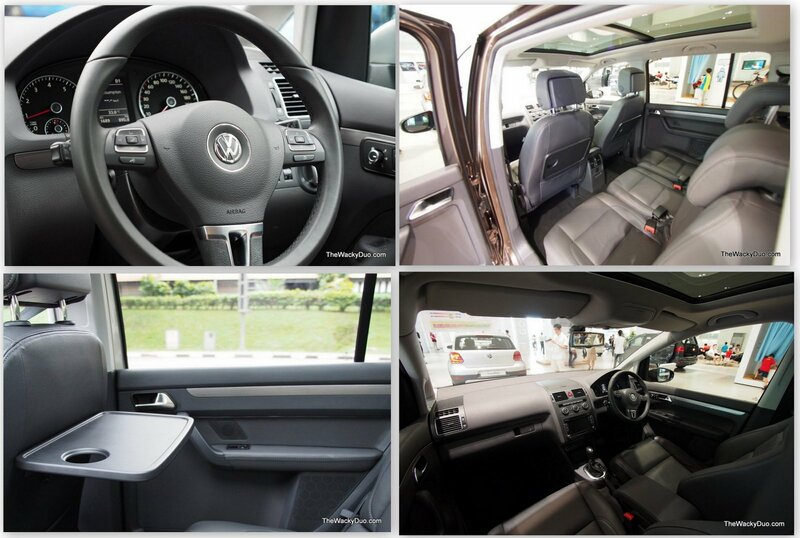 We recently trooped down to Volkswagen Alexandra for Volkswagen family day. The place was packed with activities for the Kids. As for me, I am more intrigued with the toys for grown up that are displayed around the showroom. No not the tribikes, but the cars! Having a growing family means that there will be a need in the future to have more space in the car. I was on the lookout for MPV when VW and Rise and Shine had invited us down for a test drive of one of their MPV on site. It is a preposition I could not resist. I get to test drive, while the boys get to play at the showroom. One stone two birds. Perfect. There is the Sharan and the Touran for me to choose. I decided on the Touran as the masculine lines call put to me. It's amazing how the Touran at the dimensions (L/W/H 4397/ 1794/1674) similar to a sedan can be a bona fide MPV. Appearance wise, the Touran sports the familiar Volkswagen logo and grill on the front. It may look muscular, but it is also rather boxy at certain angles. Not exactly a head turner, but a functional beast. Taking my co- driver with me, we took it for a spin around Alexandra. The ride was butter smooth and I was particularly impress with the steering. Unlike Japanese cars that comes with light steering, this German make makes driving smooth and effortless. Coming at with a 1.4 engine, it is no slouch as it is able to accelerate from 0-100km in 8.5seconds. I also like the driving position. Seated higher than compared to a sedan, you can a better Pov , making driving safer with better all round visual. Being a seven seated, you would expect acres of space in the cabin. However the Volkswagen Touran is a compact MPV , meaning space is optimised for its size. The middle seats would fit 3 adults, but the rear seats are a tad too small for them for longer rides. Kids and teens would have no issue seating in the rear. The quality of materials in the cabin are top notch. Clad in quality "Nappa" leather, seats are comfortable. We like the large 6.5 in touch screen entertainment center that doubles up as a useful reverse camera when parking. The one that takes the cake would probably be the sun roof . This is the first time me and the boys experience a car with sunroof and we were both amazed and delighted with the view from above. We particularly like how it made the cabin feel bright and airy and appear bigger than it seems. Yeah we may sound a little 'Sua Ku' but the sunroof did impress Father and Son. This MPV comes loaded with family friendly features. Here is a list of some of them. However for this model, it does not come with keyless entry or sliding doors unlike its premium counterpart the Sharan. If it were to come with it, it will be perfect for an entry level family car. Boot space is rather limited and may just fit a stroller. However it would have to make way should we go for our grocery shopping. You have the option of lowering down the rear seats for more space. As an entry level car, base on our short drive, the Touran is a serious contender in the competitive compact MPV segment . The quality of the ride stands out but cosmetically, it may not appeal to everyone. Given our short stint on it , it may be premature to make it the first choice of MPV without testing out other rides. Thanks for VW fans Rise and Shine for organising this test drive for us!